In 1813 the Archway Road was constructed to avoid the slope up to Highgate Hill. The viaduct was designed by Sir Alexander Binnie and built in 1897 over the road in place of the former Highgate Archway which was a short tunnel. 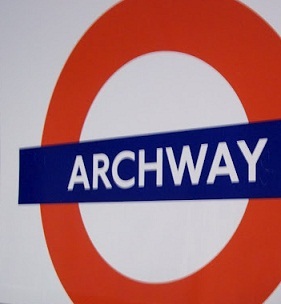 The district is, therefore, known as Archway. Railings, seven feet high, were erected on the viaduct to discourage the many suicides that took place here, but the view is still spectacular. The station was opened as HIGHGATE on 22 June 1907. Although ARCHWAY TAVERN appears on at least one pre-opening map. With the building of the northern extension to form an interchange with Highgate LNER, HIGHGATE SOUTH was considered before the name was changed to ARCHWAY (HIGHGATE) on 11 June 1939, and ARCHWAY in December 1947.